I asked one of our school mums how her boys were doing and this was her reply … “Real good … you know what they say … ‘Keep ’em in sport and keep ’em out of court’. She proceeded to show me video footage of one of them, who will probably end up a professional rugby league player, scooping up the ball, running the length of the field and scoring an amazing try. This mum has a paying job, four teenagers, health problems and incredible commitment to her kids. She told me that she spends most afternoons and nights driving the boys to footy training and her daughter to dancing. In all the hours of watching and waiting in her car and on the sidelines, she has taught herself to crochet and has made so many rugs that she has been able to sell some and give others away. What motivates her? She sees it as a necessity to keep her family busy so that they stay out of mischief. They have also proven to be quite successful at their chosen activities and she is extremely proud of them.This works for this family. But … is sport really the answer to diminishing our juvenile crime rate? Not all sports people are wonderful role models for perfect behaviour. Are the children who are not involved in sport getting into trouble? Many children are busy at tutoring or language classes on the weekends. Others are helping in family businesses or helping with jobs around the home. Is it always possible for families to be part of organised sport? Many parents have shift work and not everyone has grandparents who can help out with finance or transport. For some, a family cricket match at the park or the spontaneous touch footy match at a family picnic is about as organised as they can manage. What started me thinking about this was an article in the Sydney Morning Herald by Sylvia Pennington. It was entitled, “How to raise good children without blowing the budget”. In this article Sylvia said, “annual outlays of up to $5 000 a child are not unusual in families where children do three or more activities”. Within this article there were some tips for helping parents to manage their spending but even so, many parents cannot even manage the time and money for these activities even with these tips. I searched the article to find why the heading said “good children”. The “good” things mentioned were; to have ‘well-rounded’ children, to keep them busy and also because research “indicates those who participate in music and sports perform better academically”. What a lot of pressure today’s parents are under! Do our children really need to have every minute of their day organised? Are we forgetting that keeping busy, maintaining fitness and being successful are not the most important reasons for being involved in activities. If our children are not enjoying these costly activities what is the point of them? Our children also need time for unstructured play. Jessica Skoinkoff and Robert Engvall in their book, “Young Athletes, Couch Potatoes and Helicopter Parents: the Productivity of Play”, explore how sport and play contribute to our children’s lives and the effect of hyper involved parents on their children’s attitude to sport. They say that lack of unstructured play has lessened children’s ability to resolve disputes and pursue their own interests. Playing in a sporting team certainly has benefits but maybe not the ones that parents are counting on. 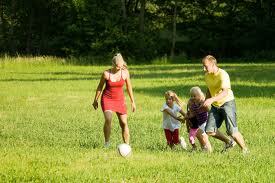 If the atmosphere is not over-competitive or pressured, the children can have fun with their friends and coaches. They can make new friends and learn important life lessons about working as a team and not trying to be the star. These beautiful happy times do not just come from being in a sporting team. They can come from belonging to a musical group, a drama group or even just hanging out with friends and skating, riding bikes or surfing waves together. What works for one family will not necessarily work for another. Skoinkoff and Engall say that “Most parents tend to parent their children in the manner that best serves their children and themselves”. It is true that more and more children are not exercising enough because they are in front of some screen or other. At another extreme it is true that some parents are running themselves ragged getting their children from one activity to the next. It is also true that some children are happily running around the streets with their friends and that they do get up to ‘mischief’. What is the answer? Keep them busy and out of trouble? Give them time to daydream and play in an unstructured way? It depends on so many factors; the child, the family, the culture, the neighbourhood, the finances on hand, available transport and local facilities. Schools are not the “be all and end all” but they can be a good place to safely try things with no fear of failure and at no extra cost. Things like sporting activities, creative arts programs, gardening and chess clubs can whet appetites, spark interests and provide outlets for energy and creativity. Often these activities in Primary School need to take place at lunchtime or recess … taking away from unstructured playing time with friends. What is the answer? Is it moderation in all things? My four children have all grown up and left school. They all have jobs and they all have hobbies which are their outlets for their energy and creativity. We tried to allow them to pursue their own interests and talents but they could only do one sport and learn one musical instrument each. Thankfully my mother paid for their music lessons. These sports and instruments were swapped for one thing and another as tastes and interests changed. There are things that some of them wished that they could have done .. but none of us have the time and money to do everything that we want to do. My youngest is 22 years old and now pays for her own singing, guitar and ballet lessons. We paid for ballet when she was growing up. She also plays Oztag once a week – she never had time for team sport growing up because of ballet. The other three all enjoy surfing, one is an artist and sings, the eldest also plays guitar and enjoys creating beautiful interiors using his carpentry skills. Their extracurricular activities have helped them to have well-rounded lives. They are privileged. Most of the world is not as fortunate. So maybe we should not necessarily say, “Keep ’em in sport and keep ’em out of court” but “Help them to thrive, then they’ll know they’re alive”.